James Stewart is one of my favourite classic Hollywood actors, and this was the first of his four Hitchcock collaborations. They’re all very good, and I know I’m in the minority here, but Rope is arguably their best work together… despite the fact that apparently Stewart didn’t like it. It’s a rather progressive subject matter for the time of its release, but it was loosely based on an actual crime that took place over two decades earlier, so perhaps that is the most jarring thing about it. Students Brandon and Phillip decide to kill one of their classmates in order to see if they can pull off the perfect murder, only to have their crime brought under the microscope by their mentor Rupert. What follows is a back and forth, with Brandon enjoying the post-mortem glow and Phillip emotionally unravelling beside him, while Rupert tries to piece the whole thing together. Hitchcock used an innovative one-camera technique which helps to give the whole thing a very intimate and claustrophobic feel, as if you’re a literal fly on the wall in the aftermath of this experimental murder. Audiences nowadays are comfortable with longer attractions, so modern cinema often throws up (a term which is apropos here) snoozefests that run over three hours, however Rope is presented as a real time affair and clocks in at a refreshingly lean eighty minutes. The entire movie also takes place in one static apartment location, so action junkies need not apply as there is no visual excitement to distract you from the limited number of characters on screen. Although Rope is extremely underrated, and you won’t see it appearing on many ‘best of’ Hitchcock lists, it is an exercise in how to build a great plot with interesting characters and thought-provoking dialogue. This entry was posted in Lists and tagged Alfred Hitchcock, James Stewart, Leopold and Loeb, Rope on August 21, 2017 by Brian G Ross. 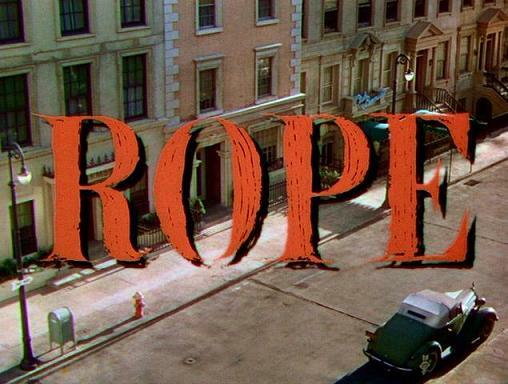 But back in 1948 – long before any of these were filmed – Hitchcock made Rope, an often overlooked masterpiece. Ever since I first watched it when I was a teenager, I thought it was fantastic, and today I landed on it while channel-hopping, just as the credits were starting. Awesome. The premise is simple: two college students (John Dall and Farley Granger) strangle someone to see if they can get away with the crime, and then have a dinner party while the body lies in the chest upon which they have arranged the food… and to say anything else would spoil the treat for those who haven’t seen it. It’s only short – eighty minutes – but it’s extremely tight, and there’s no flab in the script at all. It’s an early example of ‘real-time’ film-making, and it also makes use of some (for the time) clever editing techniques to make it seem as if it has been filmed in one continuous take, giving it an intimate, claustrophobic feel. James Stewart was always effortless, and like all great actors, you never saw him acting – whether it was talking to a seven-foot rabbit in Harvey or defending his family as a grizzled farm-owner in Shenandoah. He lived every part he played, and his role here as the curious professor who tries to figure out what is going on, is no exception. These elements make Rope an absolute gem of a movie, and if I can write something this precise – this lean – I’ll be very proud of myself. This entry was posted in Reviews and tagged Hitchcock, James Stewart, Rope on October 4, 2012 by Brian G Ross.